Sam Hoskins scored twice as Cobblers gave their survival hopes a huge shot in the arm with three priceless points on Tuesday evening, winning 2-1 at Tranmere Rovers after a heroic defensive display in the second-half. Keith Curle's team selection had stirred much debate on social media before a ball had even been kicked, but he was more than validated by his side's subsequent performance as they earned only a second win in 10 league games, moving 10 points clear of relegation in the process. Hoskins doubled his tally for the season with two smart finishes in the first-half, those goals coming either side of Sky Bet League Two top scorer James Norwood equalising for the home side. The second-half became nervier and nervier as Rovers desperately chased an equaliser, but the Cobblers, led by several outstanding performances, not least by Charlie Goode and Jordan Turnbull, clung on to ease relegation fears and jump a place to 16th in the table. All the talk before kick-off centred around Curle's team selection as he once again tinkered with starting XI, this time opting for four alterations from Saturday as David Buchanan, Turnbull, Joe Powell and Hoskins returned to the starting line-up. Powell played alongside Jack Bridge in a 3-4-2-1 formation as Hoskins led the line on his own, and it took less than two minutes for Curle's gamble to pay off. With the very first attack of the game, Turnbull knocked the ball forward and it was collected by Hoskins, who outpaced the last Tranmere defender and kept his composure to slot past home stopper Scott Davies for his first league goal of the campaign. It was just the start Town required after Saturday's defeat at the hands of Colchester United, but they then came under immediate pressure as Rovers replied by monopolising possession and pinning the visitors back inside their own half for long periods. 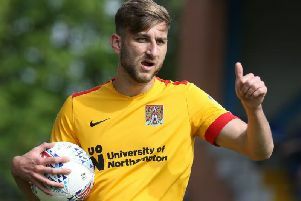 It resembled something of an attack versus defence training drill at times, and Cobblers needed some last-ditch interventions from Goode and Aaron Pierre to keep their slender lead intact. The visitors had the odd foray into home territory, but their cautious approach was undone 24 minutes in when Rovers levelled courtesy of an obvious scorer, Jake Caprice getting to the byline and fizzing in a low cross that was directed home by Norwood from just a yard or two out for his 21st goal of the campaign. Norwood saw a second attempt beaten away by David Cornell while Hoskins' pace and movement was still unsettling the home defence, which never looked at ease, and he again got the wrong side to work an opening, but this time he couldn't beat Davies. Having got themselves back on an even keel following Tranmere's early stranglehold, Town then reclaimed the lead in the third of three added minutes at the end of the first half, and again Hoskins was on target. This was a far better finish than his first goal, producing a fabulous first-time flick to guide Buchanan's cross up and over the forlorn Davies and into the far corner. Cobblers were doing a good job of frustrating the home team and in turn frustrating the majority of supporters inside Prenton Park, with Rovers unable to reassert their dominance. Norwood blasted a free-kick high and wide before Jonny Smith's effort was tipped wide by Cornell. It was not until the final 10 minutes when Tranmere really began exerting pressure on the visitors and they carved out their best chance of the half when Charlie Dagnall headed wide after escaping Town's defence. Goode produced a vital clearing header under his own crossbar and hearts were in mouths more than once during five minutes of stoppage-time, but crucial Northampton held on for a huge and much-needed victory. Tranmere Rovers: Davies (c), Ridehalgh, Nelson, Monthe, McCullough (Gilmour 85), Caprice, Perkins, Morris (Smith 72), Pringle (Dagnall 59), Jennings, Norwood.